The portal vein carries blood from the stomach and abdominal organs to the liver. It is a major vein that splits into many branches. In people with liver failure and cirrhosis, a chronic degenerative liver disease causing irreversible scarring of the liver, the liver is incapable of processing blood from the bowels. As a result, an abnormally high pressure develops in the veins that drain blood from the bowels as the body tries to form other channels for the blood to empty into the main circulation. These channels consist of fragile veins that surround the esophagus, stomach, or other areas of the digestive tract. Because of the fragility of these veins, they are prone to rupturing, which can result in massive amounts of bleeding. The abnormally high pressure within the veins draining into the liver, called portal hypertension, can also result in the formation of fluid seeping from the surface of the liver and collecting in large quantities in the abdominal cavity, a condition known as ascites. Massive internal bleeding caused by portal hypertension occurs in about 40% of patients with cirrhosis. It is initially fatal in at least half of these patients. Patients who survive are likely to experience bleeding recurrence. 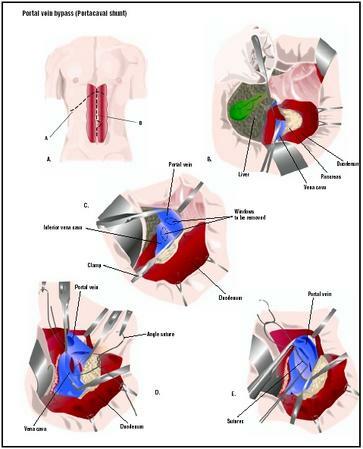 Portal vein bypass, also called portacaval shunting, is performed on these surviving patients to control bleeding. The purpose of portal vein bypass surgery is to lower portal hypertension by shunting blood away from the portal venous system and into the main venous system. Cirrhosis of the liver is caused by chronic liver disease. Common causes of chronic liver disease in the United States include hepatitis C infection and long-term alcohol abuse. Men and women are equally affected, but onset is earlier in men. Different portal vein bypass procedures are available. The surgery is usually performed under general anesthesia. The surgeon makes an abdominal incision and locates the portal vein. In portacaval shunting, blood from the portal vein is diverted into the inferior vena cava (one of the main veins leading back to the heart). This is the most common type of bypass. In splenorenal shunting, the splenic vein (a part of the portal vein) is connected to the renal (kidney) vein. A mesocaval shunt connects the superior mesenteric vein (another part of the portal vein) to the inferior vena cava. Another procedure, called transvenous intrahepatic portosystemic shunt (TIPS), has become the favored surgical approach. A TIPS is performed through a small nick in the skin, working through specialized instruments that are passed through the body using an x ray camera for guidance. The TIPS procedure creates a shunt within the liver itself, by linking the portal vein with a vein draining away from the liver together with a device called a stent, which acts as a scaffold to support the connection between these two veins inside the liver. computed tomagraphy (CT) scans, ultrasounds, or magnetic resonance imaging (MRI) scans, and in consultation with the treating gastroenterologist, hepatologist, or surgeon. Standard preoperative blood and urine tests are also performed. The heart and arterial blood pressure are monitored both during and after the operation. The patient is connected to a heart monitor and fed through a nasogastric tube. Vital functions are monitored through blood and urine tests. Patients receive pain medication and antibiotics . Once released from the hospital, patients are expected to abstain from alcohol and to follow a diet and medication schedule designed to reduce the risks of bleeding. Portal vein bypass surgery is high risk because it is performed on patients who are generally in poor health. Only half the patients survive, although the chances of survival are greater with TIPS surgery. The rate of serious complications in TIPS is only 1–2%. Those patients who survive the operation still face the risk of heart failure, brain disease due to a decrease in the liver's conversion of waste products (liver encephalopathy), hemorrhage, lung complications, infection, coma, and death. More than 90% of patients that undergo TIPS to prevent bleeding from varices will have a relief in their symptoms and experience little to no bleeding after surgery. When TIPS is performed for ascites, 60–80% of people will have relief in their ascites. The survival rate is directly related to the amount of liver damage patients have; the less damage, the more likely the patient is to recover. Cooperation with restrictions on alcohol and diet affect long-term survival. Liver cirrhosis is a major medical problem worldwide and is associated with significant morbidity and mortality from its complications such as liver cell insufficiency and portal hypertension with ascites and gastrointestinal bleeding. Before resorting to bypass surgery, physicians first attempt to treat portal hypertension with medications known as nonselective beta-blockers. These medications need to be taken daily to produce an effect and some patients may not be able to remain on beta-blocker therapy if they develop side effects. Other patients on beta-blocker therapy also remain at risk for bleeding from varices and from ascites. Another approach is to seal off the veins to prevent rupturing. In sclerotherapy, a camera (endoscope) is passed down through the esophagus to inject the abnormal veins with substances that close them off. This can also be achieved with variceal band ligation, a procedure by which the abnormal veins are tied off with small rubber bands. Although sclerotherapy and variceal band ligation are very effective in targeting the abnormal and fragile veins around the esophagus, they do not lower the pressure of the blood inside the portal venous system. Thus, portal hypertension may still result in fluid accumulation inside the abdominal cavity, or in bleeding. The best approach to relieve portal hypertension within a patient is by replacing their liver with a new one capable of filtering the blood. However, not many patients are suitable candidates for a liver transplant. See also Liver transplantation ; Sclerotherapy for esophageal varices . Current Medical Diagnosis and Treatment, 1998, 37th Edition. Edited by Stephen McPhee, et al. Stamford: Appleton & Lange, 1997. "Stomach and Duodenum." In Current Surgical Diagnosis and Treatment, 10th Edition. Edited by Lawrence W. Way. Stamford: Appleton & Lange, 1994. Bambini, D. A., R. Superina, P. S. Almond, P. F. Whitington, and E. Alonso. "Experience with the Rex Shunt (Mesenterico-left Portal Bypass) in Children with Extrahepatic Portal Hypertension." Journal of Pediatric Surgery 35 (January 2000): 13–18. Fuchs, J., et al. "Mesenterico-left Portal Vein Bypass in Children with Congenital Extrahepatic Portal Vein Thrombosis: A Unique Curative Approach." Journal of Pediatric Gastroenterology and Nutrition 36 (February 2003): 213–216. de Ville de Goyet, J., et al. "Treatment of Extrahepatic Portal Hypertension in Children by Mesenteric-to-left Portal Vein Bypass: A New Physiological Procedure." European Journal of Surgery 165 (August 1999): 777–781. "Cirrhosis and Portal Hypertension." Family Doctor. http://familydoctor.org/handouts/188.html . Portal vein bypass surgery is performed by a surgeon specialized in gastroenterology or hepatology in a hospital setting, very often as an emergency operation. What are the possible complications involved in portal vein bypass surgery? How much portal vein bypass surgery do you perform in a year? My nephew is suffering from portal hypertension and requires the T.I.P.S procedure. He is 11 years old and has been on mediction to control his condition since he was 6 months old. His platelets are now extremely low and is having regular bleed in his lower stomach due to his enlarged veins. Would the T.I.P.S procedure have a positive outcome on preventing a liver transplant, at least in the short term. I understand that you do not have sufficient information to evaluate, but all going well is it possible to extend the life expentancy of the liver. I've been suffering from portal hypertension and i few days ago i've had the T.I.P.S procedure done, but after i left the hospital I've bloated (swelling) belly, i've been with my GP but he thinks I'm constipated which i'm not conviced at all as i go normal to the loo.So now are four days since i left the hospital and still i have swollen belly.I'd appreciate if you can give me any information to evaluate. My liver has regenerated from severe cirossis.i had tips placed in me.1 year later i am very slow and dont have much balance and also very weak and tired.will this ever stop. I had a tip surgery done in 2015. I was told by my gastenerologist that two of my veins were very fat. I had five extra veins and they though there was only one. I asked him how did l have elevated ammonia. He stated it was the meds l was taking. I was having a lot of symptoms before that seizure like, falling, unconsciousness, hallucinating and so many others. My Ana and rnp are high. When l went to another clinic they told me l had several coils and the procedure wasn't done correctly and it demonstrates no flow through the symbolized area. I was diagnosed by 2 neurologist l had conversion disorder. Now l have swelling in my upper and lower abdomen and all over. Is this because of the no flow through the symbolized area and only 1 flow of the hepatic vein? And l have a lot of allergies to medication since this all began and several times l went to pharmacy and they have given meds l am allergic too. Does your liver stop all function after TIPS bypass surgery.